With our Horse Riding Hen Party Package we have teamed up with Island View Riding Stables in Co Sligo. We have designed a package that is suitable for suitable for all levels of horse riders. During this trekking tour you take a stroll along the seashore between the dunes and the rolling waves. 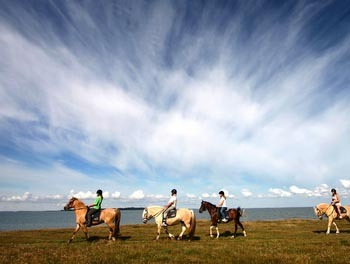 You get to enjoy unspoilt views of Donegal Bay and Classiebawn Castle in Mullaghmore on horseback. You don’t need to be able to ride to enjoy the experience. Beginners will be brought at a leisurely walk. Experienced riders will enjoy the thrill of a canter or gallop along the golden sandy beach.